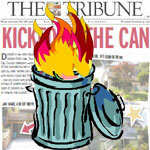 San Luis Obispo’s trash container ordinance was recently converted to “trash ordnance” fired at the city council when the Tribune published large color photos of all five San Luis Obispo City Council members’ homes on the front page of the Sunday edition. Is it fair to lob a return volley? Two years ago, I published a lightly read report on my website which revealed one of our county grand jurors was a former registered nurse. Her license was revoked for falsifying patient records, unprofessional conduct, and stealing and using patient drugs, thus depriving patients of prescribed medications. My report questioned this individual’s fitness for grand jury service. The San Luis Obispo Tribune felt otherwise. Instead of reporting the revelation, the Tribune published a critical editorial suggesting the privacy of this juror was invaded because my report included a public document where jurors list their home address. This public document was necessary in order to present incontrovertible proof that our juror and the disciplined nurse were the same individual. This week, I am struggling to see the difference between my 2009 report and the Tribune’s decision to publish photos of council member homes replete with street names for the convenience of Google Street View voyeurs. Was there a major scandal uncovered? No. 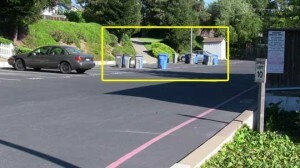 Four of the five council members left their trash containers in view of the street “blatantly disregarding” a city ordinance “that they created”. Far be it from me to defend the city council, but only three of the current five were on the council last year when the ordinance was voted upon. The Tribune didn’t bother to report this fact, nor investigate former mayor Dave Romero and council member Allen Settle, nor report that the ordinance originated with the city planning commission. Yet, the Tribune did see fit to invade the privacy of law abiding new councilman Dan Carpenter with a photo of his home. And the Tribune blundered by failing to recognize new councilwoman Kathy Smith resides in a private development and was not in violation of the ordinance. Smith was thrown under the trash truck with the rest of the council. Usually, this is called libel, but I didn’t see a front page retraction in this week’s Sunday ink. Make no mistake, the Tribune article is well-deserved by the remaining three council members who created an ordinance only enforced by neighbor snitching (termed “complaint driven” by those who feel “snitch” hits too close to home). But front page photos of homes seems uncalled for in the petty case of refuse container placement. Or, maybe I’m confused. Is trash can visibility a higher offense than nurse misconduct? More poignant, though, is how the article speaks to the level of Tribune investigative journalism. Occasionally, the Tribune performs good public service by publishing valuable information such as public salaries and holding the feet of government to the fire via presentation of fact. Still, Tribune investigative pieces are mostly child’s play: simplistic public records requests or drive-by photographing of council member residences. I am compelled to offer that the Tribune should take notice of the complicated and arduous investigative pieces undertaken by other local news sources. Hard work investigations that require days or weeks of interviews, obtaining documents, research, and professional consultation are sorely lacking at the Tribune. Instead, the Tribune is quick to criticize investigative efforts made elsewhere. Certainly not every investigative revelation exposes a violation of law, but that doesn’t mean the Tribune should criticize the ethical questions that arise. The public wants and has a right to know about public affairs. When the Tribune produces in-depth investigative reports of higher quality than elsewhere then I will give ear to their criticisms. Simultaneously, the Tribune is long on staff editorials. Tribune editorials often seek to sway public opinion, influence elected representatives and determine elections. Indeed, Tribune editorials have seeded and fueled sentiment for and against election candidates. Journalistic organizations might choose to include independent editorial content as thoughtful points of view, however Tribune editorials often seek outcomes. Presenting uncolored complete facts is a role of the press to which the Tribune frequently fails. Often times, Tribune reports mix content and editorial. Certain staff fill both shoes. Lately, a photographic editor’s blog content has been appearing under the “news” category. Whether this is by design or lack of journalistic rigour is unclear. One of my favorite local figures is Mr. Benjamin S. Brooks. Mr. Brooks–a man of superior attainments regarded as one of the most skillful members of the San Francisco bar–bought the San Luis Obispo Tribune in 1886 and served as editor for thirty years. I believe Mr. Brooks, who lies in the old Masonic section of the San Luis Cemetery, would be dismayed by the dearth of substantive local content in today’s Tribune. Kevin P. Rice of San Luis Obispo is an open government advocate. Their bias during the Los Osos sewer squabble was beyond obvious. Duerr’s local synagogue, like every other church, gas station…. name it , has financial trouble and we’re inundated with pitiful news stories (even exposing the bank’s name who held title) about how unfair it all was. Boom, the bank forgives a million bucks and others contribute. C’mon Sandy, a quarter mile down the street is the failing housing of last resort for the poorest of the poor of who you and your paper as the strongest voice here are expected to be that voice for the voiceless. Nothing, why? Backing the rich pays off better. The Trib. is way over the line of acceptable bias and endorsement of all things local. Then there’s the stupidass fluffy human interest stuff on the front page all too often. What’s next, Duerr’s favorite recipes? Kevin, great job! I am LMAO at this opinion piece. Nothing better than pointing out hypocrisy on the part of the high and mighty. CalCoast News welcomes your opinions about our published articles, your opinion about the writer, not so much, please read the article before submitting your opinion.thank you. I don’t mind critics willing to sign their name. CCN don’t be dragged into the abyss, you’re above it. 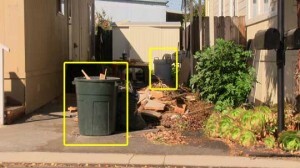 Pic 1, Nick Wilson’s trash cans; appears to be multi-family, probably not his responsibility. Pic 2 & 3, solid Tribune-quality investigative journalism – busted. Pic 4, Sandra Duerr’s house, nice of you to block out the address #, but where’s the beef? = trash can?, none to be seen. 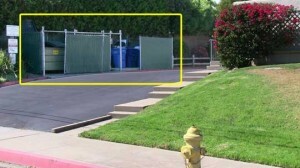 I guess this is just background/contrast to her rental, where Pic 5 shows a partially visible, neatly stowed container. Pic 6, David Sneed’s street, an egregious neighborhood uprising with 10-12 violators flaunting authority (pic needs time stamp + info on pick-up time for effective prosecution), but it looks like time to call in the SWAT team. Duerr’s trash can is behind the bush. According to the Tribune, they said placing a trash can behind a bush is in violation of the ordinance and they “outted” one of the CC members for it. You have correctly ascertained that not all of these photographs indicate a violation of the trash can ordinance. However, you seem to have failed to recognized that this is an opinion piece. It is not investigative journalism. Further, this opinion quite intentionally never makes any claim as to the applicability of San Luis Obispo’s ordinance in relation to any of the photographs. It is a gibe aimed at the Tribune’s “investigative” piece which is problematic in many ways. In regards to “Pic 4”, the gold star is not covering address numbers. 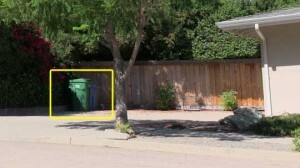 It is mockery of the Tribune article which similarly used a gold star on their photograph of Council member Dan Carpenter’s home to denote approval since no trash can was visible from the street. With today’s Photoshop software it is far from necessary to use elements (like the gold star) to hide features. 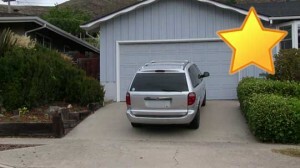 For example, the license plate on the vehicle was removed in this photo to protect privacy. Compare to the Tribune article which revealed the street names of each and every council member, including Mr. Carpenter, making their homes easy to locate. 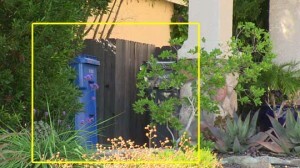 Similarly, “Pic 3” an address number was removed from the mailbox. This photo is not “solid” investigative journalism, and neither was the Tribune’s photo–this is the same private development where Council woman Kathy Smith resides and the ordinance does not apply on private streets. This photo was included because it furthers the intended gibe aimed at the Tribune due to their faulty investigative journalism which fingered Council woman Smith as “blatantly disregarding” the ordinance. With regard to the remainder of your comments, again it is emphasized that no claim is made as to the applicability of the ordinance. This piece is not investigative journalism; it is commentary. I don’t always agree with you Kevin but this was a great opinion piece. I wanted to peek at the story of the nurse but couldn’t find it with a simple Google search. Could you please provide a link for a refresher course. Thanks! The scope of the original report was to question the propriety of jurors who had a conflict of interest in participating and voting on a dune report. The nurse was an unexpected discovery. This 50-page report *was* intended to be of investigative quality and provides thorough footnotes and 35 pages of exhibits in support of the assertions and arguments presented. First off this is CLASSIC. Second. I think the whole trash can ordinance is a joke in the first place. Kind of like I posted about the plastic bag ordinance couple days ago. We are legislating ourselves to DEATH with stupid laws. Can’t we all just police ourselves like grownups???? I am in the same place as a lot of Trib-smackers: I chide them for not acting like a grown-up newspaper, and then I cheerily point out that I don’t buy their newspaper anymore. I am thinking that there’s some cause-and-effect going on. I don’t give them my quarter or look at their ads, therefore, they have less means of doing good research and investigative journalism. I don’t know what the solution is, but I do know that I’m part of their problem since I do not fund them with either my money nor my attention (scant though they both be). If you are like me, you don’t buy their newspaper anymore because of their inability to serve as an independent media source for its readers. I don’t support newspapers who are nothing but mouthpieces for the power structure in SLO County. If I wanted nothing but what the powerful local people wanted me to believe, I’d just go to their websites and read their press releases. A lot of the time, the Tribune simply copies the press release verbatim, without even bothering to verify the information, as they did with the John Wallace press-release response over the Grand Jury findings. What the Tribune printed wasn’t even close to the truth. It was a coverup-by-press-release for John Wallace. They subsequently took down the article. I am a new subscriber to the tribune. Just started almost a month ago. I do not read it expecting any news or balanced coverage. I like to read as wide a variety as I can, and the Trib regurgitates enough of LA Times and NY Times that I don’t have to put up with them. Plus, I like coupons. And the Obits… I know, I know.